The Florida Life: The First Bridal Shower! 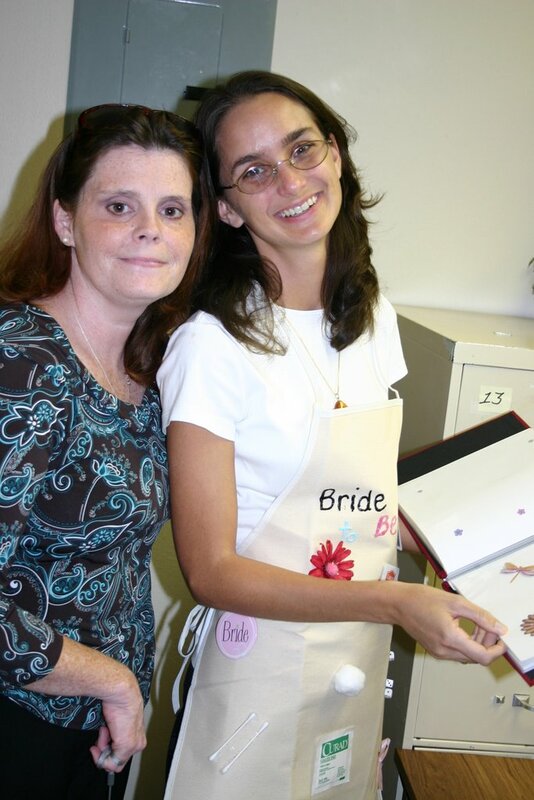 My wonderful office threw a surprise Bridal Shower for my co-worker, whose wedding is the week before mine, and me. The whole thing was arranged by the lady pictured with me there, a volunteer with our program. She was working with me when she was a brand new volunteer, and we became very close. 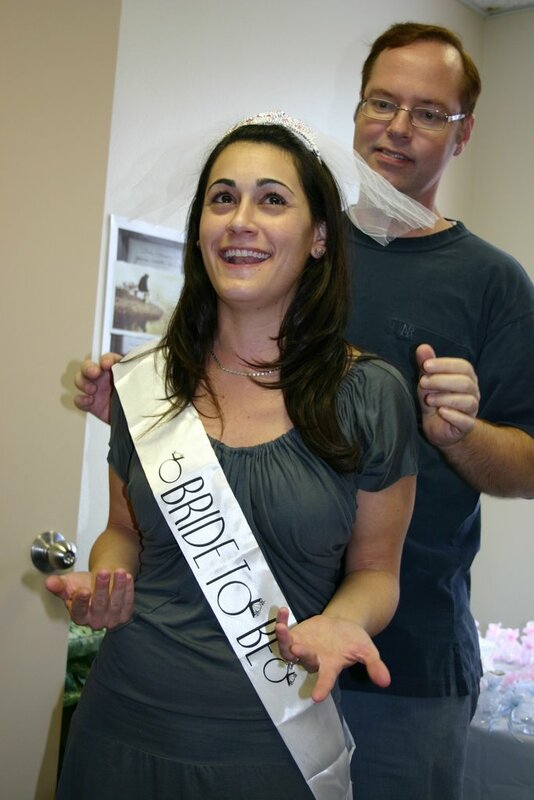 Apparently, she approached my bosses about handling the bridal shower, and they happily turned it over to her. She really outdid herself. The most memorable part, to me at least, was right at the beginning. This was a surprise party that almost ended up being a surprise for the hostess. She scheduled it during our weekly (mandatory) case review with our Litigation Director, so we'd be sure to be there. But then our Litigation Director took an unexpected vacation, so we thought we had an unexpected afternoon free. (You see where this is going, don't you?) Yep, I went home for lunch and seriously contemplated just taking the afternoon off and napping. However, I decided I would go back to work, finish the report I was working on and then go home early. I arrived back in the office just a few minutes before the time she was expecting to start the shower. My co-worker, on the other hand, had left for lunch only fifteen minutes before. Her plan was to go home, eat a sandwich and lie down for a few minutes because she had a killer headache. Her assistant tried to get her back by calling and telling her that our volunteer was there expecting a meeting with her. She insisted she had no such meeting scheduled, and it must be with someone else. She was going home for awhile. So, our poor volunteer had to revise her plans. She comes and gets me from the office and takes me down to the back room where she's set up this whole party. (Her plan was to get both of us in to the room for a 'meeting', surprise us, and get a few pictures before the hordes arrived.) I was absolutely stunned, and definitely wishing I had dressed a little nicer. I was also very, very glad that I didn't call the office and tell them I wasn't coming in. Especially after I learned that my co-worker had gotten away from them. We took a few pictures of me in my 'bride's apron' (part of the shower games), with the volunteer, and in the elaborately set up rooms. 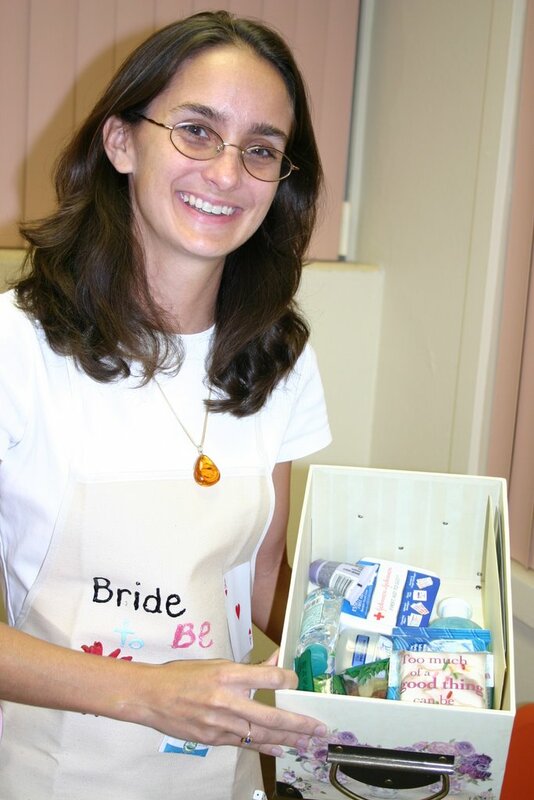 This photo is of me, still somewhat in shock, with the "survival kit" she made me. It also has a copy of the (handmade) shower invitations that were given to my co-workers. She truly thought of everything. But, we were still missing the other bride who had just left for an hour, and would most definitely miss the beginning of the party - in our honor - at this rate. So, they asked me to call her and get her back. (We're pretty good friends, so they figured I could insist.) I called her and told her that our Litigation Director had forgotten to tell us about this important meeting with the volunteer - always blame it on those out of state - and I really needed her to come back right away. She tells me she just needs to lay down for awhile, can it wait half an hour? I really don't think so, I insist, everyone here is in a tizzy and I really need you to come back. Okay, I'll get a sandwich and be back in 15 minutes she says. Hon, I'll go next door (to the local greasy spoon) and grab something for you. Please just take some aspirin for the headache and come on back now. Apparently we're already late, and you know how everyone gets when they don't know what's going on. Please, can you come back now? FINE, she huffs, I'm turning around now. Mind you, at this point, she is royally ticked off with me. I won't even give her fifteen minutes to get a sandwich? It's not like she forgot about the meeting and that's why she's late. She didn't even know about the meeting, for heaven's sake!?! (She didn't actually say any of this, of course, but it all came through loud in clear in her voice. ) Later she told me that she was thinking "Cara, of all people, knows you just need to lay down for a few minutes sometimes. Why is she insisting I come back before I've been able to rest for a minute?" And then, when she gets back to the office, she tries to go to the lounge to heat up the can of soup she brought, and our co-workers are insisting she has to come down to the back room for the meeting right now. (There were two tables of food, since our volunteer was very diligent that there be two of everything at this joint shower.) Between the lack of food, the headache and the shock, I think we are very lucky that she didn't just collapse to the floor in a giant heap of quivering mush. Incidentally, she instantly forgave me for being so pushy. 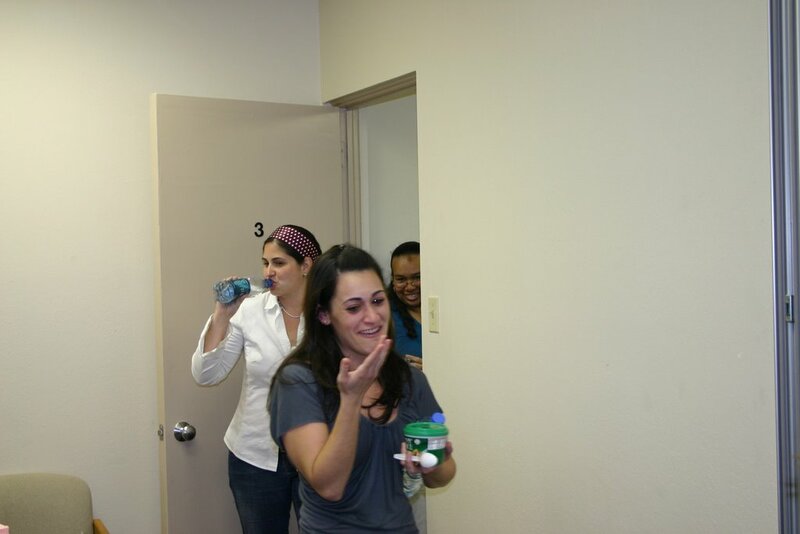 And her headache went away in the face of so much love an friendship from our Legal Aid family. No medicine can do for you what an outpouring of generous friendship does. Anyway, since they had finally managed to get the errant guests of honor back in the building, the festivities could begin. They were pretty great, too. We started with shower games, and despite my repeated threats to boycott my shower if there were games I played them. (I made the threats to my co-workers; it never occurred to me that I needed to make them to anyone else.) The other bride and I decided we got to play the games as a team, since we were joint guests of honor. We still didn't manage to win anything. And we were pretty apalled at the words we missed in the word scramble. Romance being among them. We were also showered with wedding gifts. They were thoughtful, individualized and generous. For days now I've been trying to think of words to describe how amazingly wonderful our co-workers were. How we felt in the face of that outpouring of support. How we looked at each other at the end of the party and said "can you believe this?" Each knowing exactly what the other meant but not having words for it. This is the best part of a wedding - not the dress or the flowers or any of the other three trillion things that we think matter so darn much that we make ourselves crazy over them. It's the outpouring of love. Our love for each other, and the desire to make a public promise to work for that love. The love of our family members as they put hours of effort in to making our weekend beautiful and fun, grinning in pleasure all the way. The love of our friends (and again our family) as they brim with excitement and pleasure at sharing the start of our marriage.